In perfect conditions, reaching the 5898m above sea level summit of Kilimanjaro is a major accomplishment. Oxygen levels at this altitude are less than 50% than that at sea level. The human body is not designed to survive at these heights and altitude sickness becomes a serious threat to any climber attempting the ascent to the top. 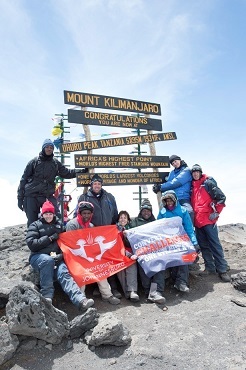 The team from UJ, however, reached Uhuru Peak during above normal wind conditions, with temperatures in the summit region ranging from -12°C to -15°C. Prof Tanya du Plessis, lecturer and post-graduate research supervisor at IKM, UJ, not only shrugged off the many obstacles thrown in her path by the mountain but did it while gathering crucial information by means of observations, interviews and questionnaires. The information will be utilised in her research on the relationship between the many parties involved in the ever growing tourism industry of Kilimanjaro, namely porters, guides, park rangers, trek outfitters, tour operators or travel companies, and clients attempting the summit. Her argument is that Corporate Social Investment, if applied correctly, can benefit all of the above mentioned parties by being a Competitiveness Accelerator. The research will finally contribute to increased regulation on all aspects of this intricate system of support on Kilimanjaro. Of particular interest is how porters, who in most cases rely on tips from clients as their only source of payment, are supported on and off the mountain by their employers. Supporting Prof Du Plessis as research assistants were two UJ alumni, Mr Molefe Ratsoana and Ms Khutso Maahlo, both of whom have graduated as IKM Honours students. 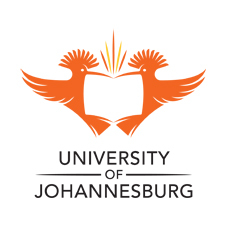 The remainder of the team included Ms Andrea Potgieter and Ms Tracy Lefika, both IKM lecturers at UJ; Mr Jan Potgieter, in-house photographer at UJ; as well as Mr Rudi Feiertag and Ms Celeste van der Walt who attended in their own capacity. In addition, the expedition was supplemented by four guides – Dawson Robinson Chonjo, Gabriel Rassy Lukumay, Steven Fred Mtui and Frank Mrema. A total of 27 porters were contracted to carry food, water and camping equipment all the way to Barafu Camp (4673m), which served as a base for the summit attempt.